Bring a large pan of salted water to the boil, cook the pasta according to packet directions, drain, refresh and toss in half a tablespoon of olive oil to keep the strands separate. Remove oysters from shells, rinse the shells and set both aside. Heat remaining oil in a pan over medium heat, add pancetta and cook for 2-3 minutes until starting to crisp. Add garlic and cream and cook for 1-2 minutes until reduced by half. Add parmesan and parsley, season and keep warm. Pour boiling water over pasta, drain, then divide between shells. 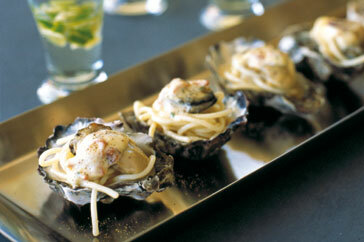 Place an oyster on top, drizzle with sauce and serve while still warm.